And we’re BACK! With another round of the Beautiful People linkup for writers! What happened to the April edition, you ask? IT DIDN’T HAPPEN, THAT’S WHAT. Blame it on Camp NaNoWriMo (which Sky and I participated in splendidly) and on busyness of life in general, and oh, you can totally blame it on cake too. Cake is distracting. But here we are again. No need to panic. Don’t forget to try and stop by to visit some other blogs linked up! (I do my best to visit everyone but…I fail. I need 9 more eyeballs, peoples.) You can make some glorious writerly friends this way. And if you have any question and/or theme suggestions — YELL NICELY AT US. We listen. The linkup is open all month. Just a) grab the questions, b) answer them on your own blog, c) either link to our blogs or take the official button, and d) linkup below! You can check out the official page (FAQs and examples and archive of previous lists) if you wish. [/accordion][accordion id=”two” title=” >> FREQUENTLY ASKED QUESTIONS” open=”false” ]What is Beautiful People? 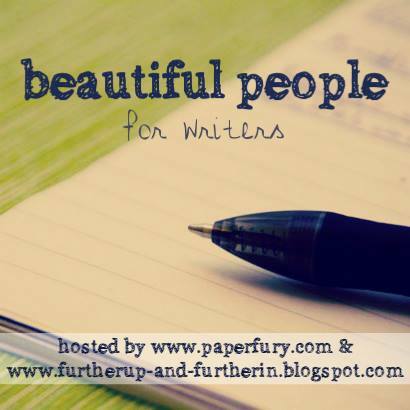 Beautiful People is for writers. Every month, we post a list of 10 questions for you to answer about your characters (or your novels). It’s designed to help you get to know your characters – their quirks, their personality, their flaws, and who they are. Can I join Beautiful People anytime? Absolutely. It’s designed so you can jump in whenever new questions are posted. They’ll be posted at the beginning of the month, but you can join in at aaaany time. Can I submit questions to Beautiful People? Yes! In fact, we encourage it. If you’d like to submit questions, you have two choices. Either leave a comment on Paper Fury or Further Up and Further In, or send us emails. Whichever way you choose, we’ll attempt to use your questions. Don’t forget to grab the button and/or link to this page on your blog! So anyone can join in! How often do they smile? Would they smile at a stranger? What is the cruelest thing they’ve ever been told? And what was their reaction? What is the kindest thing they’ve ever been told? And what was their reaction? What is one strong memory that has stuck with your character from childhood? Why is it so powerful and lasting? What book (a real actual published book!) do you think your character would benefit from reading? Have they ever been seriously injured? How severely? How did they react? Do they like and get along with their neighbours? On a scale from 1 to 10 (1 being easy and 10 being difficult) how easy are they to get along with? If they could travel anywhere in the world, where would they go? Who was the last person they held hands with? so who survived Camp NaNoWriMo?!? what writerly goals do you have for May?? IS ANYONE EDITING NOW? (i am editing. also crying, coincidentally) and have you had any BRILLIANT ideas lately that you want to gush about? i have cake to share. let us chat. Previous Post: « These Characters Need Childhood Prequel Novels. Immediately. It’s a creepy little fantasy thing, and I’m so terrified of writing it because in all honesty, it scares me. Gush: A Ferris wheel that goes haywire, people with masks instead of faces, a psycho villain modeled after Evan Peters from AHS, eyes that change color in the woods, and a lot of strange puppets. DOES YOUR WRITING SCARE YOU? I never thought I could be scared by words I string together, but then again I never thought I would spend my days in the deep dark holes of Pinterest, procrastinating. Anyway, I’m hoping to finish this before school starts (2nd week of June) so I can breathe and make a good impression in front of my classmates and teachers and not freak them out (because writing books makes me cranky and unpredictable) and do editing during July and the rest of the school year. But. dude. YOUR STORY. *tries to contain excitement* That sounds AMAZING. I honestly love it (psycho villains and strange puppets ajfdskladj need in my life immediately) But to answer your question…not really? 😂 I’ve never written anything creeptastic yet! BUT OMG WRITING MAKES ME CRANKy aND UNPREDICTABLE TOO. 😂 I think it’s because I get too lost in my thoughts/book, so when people drag me out of it it’s somewhat confusing and disorientating. My brain = not good at multitasking. AHEM. I actually had an awesome month because I finally finished the first round of edits for Draped in Deception (the assassin falling in love with her target story). Which means I’ve been working on it from the first draft to now for over a year. I have no idea how I’ve managed it. Eeeep, YAY I AM SO GLAD!! 🎉 I am sorry we missed last month. 😂 BUT ANYWAY. WE’rE BACK. WOOT. But I can’t wait to read your post too, eeep, your story sounds amazing. CONGRATS ON FINISHING A ROUND OF EDITS. That deserves cake. And copious amounts of CHEERING. Huzzah! We actually have a childhood set of questions planned out and you reminded me about it. 😂 SO YES. That will be coming!! So glad you’re back! I really enjoyed taking part in Beautiful People; so much fun! I’M DROWNING IN WORDS THAT NEED TO BE EDITED, at the moment. Also, I LOVE THIS EDITION of Beautiful People. I didn’t participate in camp NaNo because other writers terrify me and talking about writing scares me and I know those are synonyms but it was for emphasis, okay? I’m editing this May and, will probably need a million cupcakes and cuddles from my puppies that seem to weigh a ton, to get through the mighty manuscript I’m working on. Also, I have exams this month…Writing and exams NEVER go hand in hand with me because I get too distracted but I can’t wait to do this months edition and see what other writers are up to! Other writers ARE totally scary. I mean, we’re all naturally a little bit psycho, so if we all get together IT’S BOUND TO BE SOMEWHAT DAUNTING, RIGHT?! Ahem. Oh oh but YAY for editing in May, Kat! YOU AND ME BOTH! We can send each other virtual cupcakes and cry. I survived, and I just got Scrivener for my birthday yesterday! It’s not until August, but my coupon was expiring. xD I was thinking about Peter Pan and got a scary retelling idea! OMGG YAY FOR SCRIVENER!! (Honestly I love Scrivener so much I could basically run away with it and marry it at dawn. *hugs Scrivener*) AHEM. And yayyyyy for Peter Pan retellings!!! I’ve done a creeptastic one in the past but it didn’t work out very well. hehe. 😂 GOOD LUCK WITH YOURS!! I’ve had my first NaNo-failure!!! Seriously, this year so far has been awful for writing. I’ve mainly being trying to revamp old ideas which…hasn’t worked. So I’m trying something entirely new. It’s a mash-up of gothic horror and sports story and I am 99.9% convinced that it won’t work, but I’m going to have some fun with it. Fall back into writing for me instead of constantly second-guessing myself. Yay, another Beautiful People! I missed being able to do it in April, but I’m glad it’s back. Looking forward to actually doing it! I DID WIN CAMP NANO! YAAAY My goal was 20K and I wrote 28.4K!!! I needed those 20K to get my editland passport BUT being my brain the mushy mess it is I added only 15K words to book 1 of my trilogy, Then 8K went to book 2 and 5.4K to book 3. SOOOO I’m hoping to blog ahead this week and get a few posts schedule [I’m in that challenge] so I can finish those infamous last 5K words of book in May and plan my trip to editland!!! I actually don’t mind editing, I just don’t want to edit forever and a day. I’ve been working on Gearbound a lot, and I’ve got the most WONDERFUL idea for a contemporary story about an orphan girl who goes to live with this family who owns a bakery(mainly cake and cup cakes and stuff) and it’s about how she heals. It’s also set in the summer time. I’M SO EXCITED TO START WRITING IT. ARGHHH. DUDE. You said bakery and I immediately LOVE your idea. Ahem. 😂 But it sounds so nice and cakey and warm and eeeeeepp…I hope it’s fun to write! ;D Do you do multiple projects at once?! I can’t. 😂 I have to only pick one. Although I DO plot multiple books…because my brain won’t give me a break. Erk. Yeah I do write multiple projects at once! It’s weird. But the orphan/cake one is my summer project : I’m going to attempt to write the entire first draft in a notebook. Omg the entire first draft HANDWRITTEN!??! YOU DESERVE A MEDLA OR A GARGANTUAN CAKE RIGHT NOW. Or both. Definitely a both. Better yet: a medal MADE OF CAKE. Ahem. Least to say … GOOD LUCK! A medal made of cake??!! Sounds delicious. Could it possibly be cheese cake? 😀 and thanks! AHHHHH congrats on finishing editing!! THAT IS AN AMAZING THING. I HOPE YOU CELEBRATED MUCHLY. And omg, the waiting-for-others-to-read-it is super terrifying. *builds a protective pillow fort around you* YOU GOT THIS. YOU CAN DO IT. p.s. wow proof-reading this comment I understand why my word counts always get out of control. I start talking about something then geT OFF TOPIC AND NEVER COME BACK?? omg help. YES I HAVE CAKE TO SHARE. NEVER SAY I’M NOT A BENEVOLENT OVERLORD. *cuts cake magnanimously and gives it to the mere mortals* But YES, omg, we were both so busy and couldn’t catch each other. 😂 But it was good to take a break anyway, since we haven’t missed a month in over a year now! Oh, this looks really interest. No blog to link it to though. YAY. I’m so glad this is back. Although God knows I haven’t been blogging at all lately. Or writing. EEK. But I only have 5 weeks left of this semester and then 8 weeks of holidayssssss which is very exciting 🙂 These are excellent questions. I HAVE MISSED YOUR INTERNET PRESENCE IMMENSELY EMILY. *cries* The trials of being educated I suppose. But yayyyy for holidays soon!!! I’ve been reading about these linkups for a long time, but I never really understood what they were or where they were coming from. Probably a lot of that issue is that I’m not tech savvy. However, I think I get it now. Thank you! This is awesome! Yay! I think I am going to anylize a chatracter from the Other WIP. *flails* And I so enjoyed reading it!! I missed this last month, great questions! Okay, firstly – April was literally less than a week ago, how does it feel like it was 10,000 years ago already??? I was SO SO BUSY with school in the month of April…..seriously, whose bright idea was it to make both NaNoWriMo AND Camp NaNo the second-to-last months in the semester, where the teachers start panicking because they’re running out of time and start BLASTING you with homework….narrr. BUT, I did make plotting progress on my sorcery WIP! Well….it was more like “Let’s ignore the bits we actually need to fix and just write other bits” sort of progress than, you know, actual progress, BUT WE’RE GETTING THERE. I would like to reach page 100 by the end of the month, which is super doable as I am at page 93-ish right now. But I literally got bombarded with ideas for other novels all during April, you have no idea. I am that super-paranoid type of writer who’s scared to mention too much about any of my ideas on the Internet for fear they will be STOLEN, but I’m also the type of writer who LOVES talking about writing, so…….that doesn’t work out very well. But to summarize a few of my recent ideas: 1) A Heaven vs. Hell novella where an angel gets picked up by a band of renegade demons, 2) WAR ON PLUTO, 3) Bodyguards for the Greek gods. Unless that’s been done already by Rick Riordan or someone else, which I wouldn’t know because I never read any of the Percy Jackson books growing up……oops?? Oh oh I DO have an idea, Ellie. I HEAR YA. 😂 I basically am always bombarded with ideas when it’s the WORST time. haha. Ahem. (But it’s also exciting to get a ton of new ideas??? So I can’t complain too much??) Ahem. And fair enough not talking about your ideas! Nothing wrong with being a super secret writer. 😉 I honestly don’t worry about ideas-being-stolen because even if I say “I’m writing about pirates and a chocolate factory!” no one is going to write that like I will. *nods* Plus writing is haaaaard and the chances of someone being as passionate about my ideas as I am is like, zlich. Ahem. BUT THAT’S MY REASONING ANYWAY! You totally do what’s best for you!! Hoping it’s okay that (while these questions are fabulous and I do not mean to diss them AT ALL) I was in a summery mood today? So I sort of used some questions in the archives? From July 2015? I’m so rebellious you probably don’t even want to talk to me, but as I have no intention of corrupting the linky, it’s in the CommentLuv if you want to take a peek. Anyway – I’m loving everyone’s contributions this month! There are so many books that need to be finished so I can read about the beautiful squishy characters. I survived NaNo though I’m not very far into writing that book. I am rewriting the previous book now though. The beginning needs to be completely reworked and I still haven’t figure out all the important things. And I have an idea for a fairly funny short story. It’s for an anthology completion and I’m going to write it with my brothers. One of my brother’s did NaNo too. I’d suggested he did sometime, but he went and found a cabin all himself and I only found out by accident. And now he’s keeping on with big goals and putting my current efforts to shame. While simultaneously keeping up with his pen making business. It’s kind of annoying because I never seem to have enough time for everything. Highly motivated and achieving siblings ARE ANNOYING. *stamps foot* Have fun with your kind sibling rivalry. Actually I’m very glad he’s motivated. I love my brothers. They’re wonderful. But my book does have alot more potential for being published one day. His is full of cliches, borrowed ideas and funny references and his writing skills could do with a lot of improvement. *not a guarantee that I will actually do it this month.